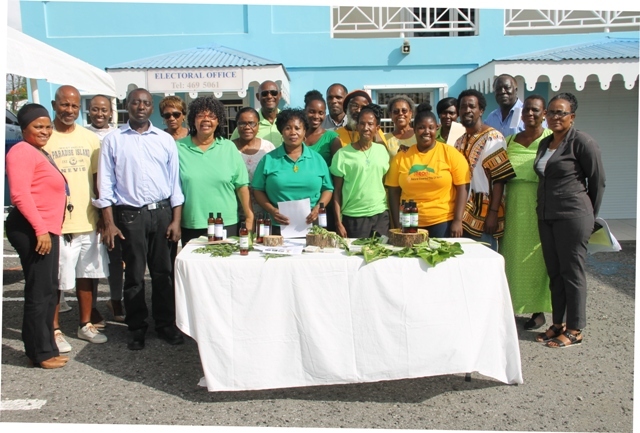 NIA CHARLESTOWN NEVIS (May 25, 2018) — A workshop designed to expose participants to the potential of essential oils and the application for things that could be produced from them, ended on a high note in Nevis on May 23, 2018 with a mini exposition of products. 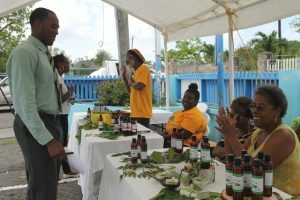 Mr. Timothy Prescott, facilitator of the two-week Essential Oils Workshop, hosted by the Small Enterprise Development Unit (SEDU) in the Ministry of Finance on Nevis, described the training session as one of the most successful he has held in his career. He expressed satisfaction with the level of interest displayed by the 18 participants. “This is the first workshop that participants got ahead of me… I’ve got to say, this for me is one of the most energetic and successful workshops that I have done so far and this is about my 35th workshop in the last five years. “You would think on a small island people would be less excited and less inclined to be thinking how you put this together for business… From the beginning, I was being shot some of the most penetrative questions about ‘How do you market this?’ ‘How do you get this part put together?’ ‘What is this good for?’ ‘How I will be able to use this?’ The important questions that show people are thinking and actually want to put the knowledge in proper use,” he said. He used the opportunity to challenge the participants to begin making products for export, some of whom had made products for the exposition. He stated that by the time he returned to Nevis shortly that they will be producing. “I will start your export function going by making an order right now for 10 gallons right here and this is not a joke. Ten gallons of aloe hydrosol. So get your aloe going. You know how to price it already. “I am starting the export process to show that it is really a regional and international product that is accepted across the world,” he said. Mr. Prescott reminded the workshop participants that essential oils is a million dollar industry. 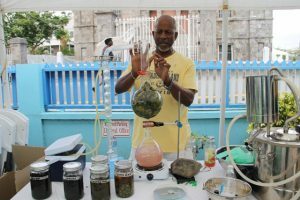 He said a growing number of people in the Caribbean are getting into the knowledge that hydrosols are distilled waters, with the added benefit of having essential oils infused into it. He also urged them to set up their Facebook page and to keep in touch with him to expose them and their products to clients to whom he is constantly exposing other people who produce hydrosols. Meantime, Mr. Eustace Esdaille, a participant at the workshop said the attendance was high throughout and they had the opportunity to learn a lot from the facilitator. “I think that we learned a lot and we were able to produce a lot, all the hydrosols that you saw here and all of the soaps because much of what was done, was a result of all that we were able to do on a daily basis for the last couple of weeks,” he said. Mr. Esdaille added that because of the workshop, participants were able to establish networks and friendships that would be maintained beyond the training session. He thanked those who were instrumental in making the workshop a reality and assured that what the participants learnt would not be wasted. “We learned a lot when it comes to presenting the goods. When it comes to packing our goods, we learnt about that. When it comes to pricing our goods we learned about all of that and…I promise…you will not be disappointed,” he said. 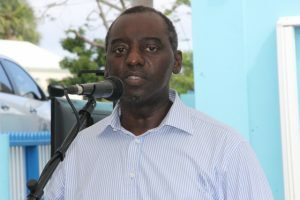 Other remarks were made by Mr. Colin Dore, Permanent Secretary in the Ministry of Finance; Mr. Augustine Merchant, Coordinator, Inter-American Institute for Cooperation on Agriculture (IICA) Delegation in St. Kitts and Nevis and Mr. Wakely Daniel, Permanent Secretary in the Premier’s Ministry. 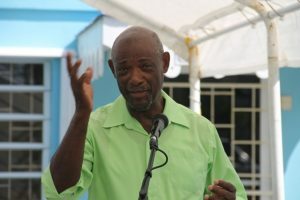 The vote of thanks was delivered by Mr. Delroy Pinney, a workshop participant.